The first Hussars are thought to have been Serbian nobles seeking refuge in Hungary. The tradition of hit and run tactics of the Hussars found a fertile home in Hungary where they became influenced by the Magyars and the Uyghur Turks. 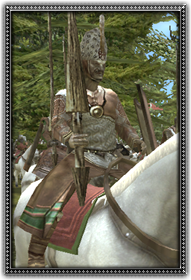 Very fast, these elite lancers are equipped with light mail or brigandine armour and armed with lance and sword.